Celebrate the power of friendship with Frog and Toad—a Caldecott Honor Book! From writing letters to going swimming, telling stories to finding lost buttons, Frog and Toad are always there for each other—just as best friends should be. These five adventurous tales are perfect for Level 2 beginning readers. 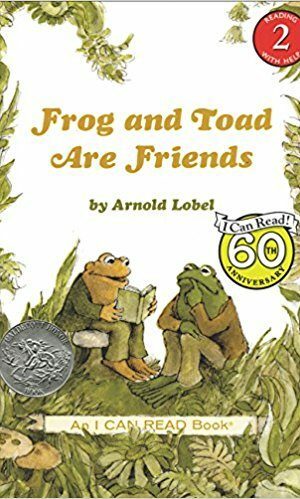 The classic Frog and Toad stories by Arnold Lobel have won numerous awards and honors, including a Newbery Honor (Frog and Toad Together), a Caldecott Honor (Frog and Toad are Friends), ALA Notable Children’s Book, Fanfare Honor List (The Horn Book), School Library Journal Best Children’s Book, and Library of Congress Children’s Book. Look at the book cover with your child. Have her think of ways that Frog and Toad are alike, and ways that they are different. As she reads, see if she can think of more ways that they are alike and different. Why does Frog trick Toad into thinking that it is May? Was that a nice thing to do? Even though he tried many different silly things, Toad couldn’t think of a story to tell Frog. How did all those things help Frog think of a story for Toad? Why did Toad sew buttons all over his jacket? Why did he give the jacket to Frog? How do you think Toad felt when he had to get out of the water with all of the animals watching? What are some of the different ways that Frog and Toad were good friends to one another? What are some of the ways that you’re a good friend? Chapters with lots of words on the page don’t have to be intimidating to emerging readers. Each chapter in this book is like its own short story, so you can read one chapter per sitting to ease your child chapter reading.